As most of you know, I am a part of the Chicken Soup for the Soul network. So, every time a new Chicken Soup for the Soul book is published I get to review it. I am sure that almost everyone knows about the Chicken Soup for the Soul books. However, for those that don't know, Chicken Soup for the Soul books are short stories sent in by real people about their own lives and experiences or sometimes about the lives and experiences of close friends or relatives. These books are at the top of the best sellers lists. 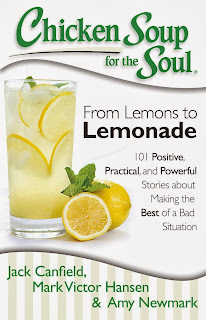 Chicken Soup for the Soul: From Lemons to Lemonade: 101 Positive, Practical, and Powerful Stories about Making the Best of a Bad Situation by Jack Canfield, Mark Victor Hansen and Amy Newmark is full of stories of people making the best of a bad situation. This book came at a great time for me. It seems like nothing is going right for me lately. First, these stories show me that my life could be worse. Nothing catastrophic has happened (knock on wood), just loads of little things piling up. As many of you know I have fibromyalgia, and basically live with constant pain. Some days are better than others. It is not life threatening, just a pain (literally). Anyway, my pain levels have been flaring (probably because I’m trying to do too much and because of stress), our A/C has been giving us problems, my Kindle broke (really need for my book reviews already scheduled), computer problems (again I need to work), the car broke down, and more. These problems are nothing compared to some of the stories. The stories are life affirming and can help you through your difficult times. I really liked the story “Rescuing Myself” by Margaret Nava. She was able to get out of an abusive marriage, and able to follow her dreams. It is hard to get out of an abusive relationship, especially because your self-worth/self-respect is usually very low. I know, I’ve been there. Once you’ve gotten out of that situation, it feels like a ton of bricks have been lifted off of you. The sense of freedom and opportunities is exhilarating. It is scary, with all of the unknowns, but it is so worth it. You don’t have to read this from cover to cover. You don’t have to be a big reader to enjoy this book or any other Chicken Soup for the Soul book. I highly recommend this book, Chicken Soup for the Soul: From Lemons to Lemonade: 101 Positive, Practical, and Powerful Stories about Making the Best of a Bad Situation. These make great gifts, especially for those hard to buy for people. If you aren’t ready to purchase a copy or you would like another copy for someone else, you can try to win one. Check out my post where I am giving away 3 copies of Chicken Soup for the Soul: From Lemons to Lemonade: 101 Positive, Practical, and Powerful Stories about Making the Best of a Bad Situation.